AGC Master and AGC Slave Extinguishing Apparatuses are constructed in the form of a 19’’, 3U (1U=1¾”=44.45mm) height panels designed to fit the top shelf of the rack cabinet. The fire detection and control panel is connected to two monitoring circuits with optical smoke detectors (fig. 1. yellow indicators). High sensitivity detectors detect smoke in the early stage of fire. The device continuously tracks the amount of smoke in the air and the alarm is activated, as soon as fire is detected. One detector located in Extinguishing Apparatus AGC Master or Slave provides enough security for smoke to be detected and the alarm launched. The connection between the circuits and the subsystems of fire detection and fire suppression enables launching of the extinguishing procedure (min. one smoke detector on each of two circuits needs to detect smoke to launch the alarm). The FE-36 extinguishing gas is released to the inside of the cabinet through a nozzle placed on the bottom of the AGC Master and AGC Slave Extinguishing Apparatuses (fig. 1. blue indicators) after 10 seconds. In the case the AGC Master and Slave Extinguishing Apparatuses are applied as a joint system the gas is released simultaneously. Fig. 1. 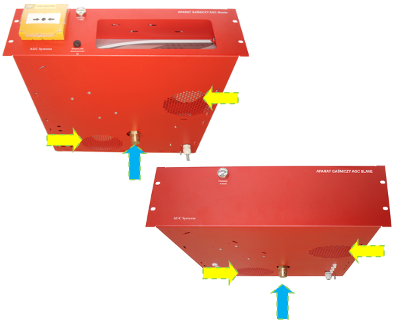 AGC Master Extinguishing Apparatus (left) and AGC Slave Extinguishing Apparatus (right) with the marked placing of the optical smoke detectors and nozzles. START EXTINGUISHING button may be also used to launch the extinguishing procedure manually. Along with the gas release the ventilation in the cabinet is shut off and the information about the initiated extinguishing procedure is transferred to the building’s fire indication system, surveillance etc. auto mode – release of the gas is automatic after response of two detectors or by pressing the Start Extinguishing button. Auto mode is the standard mode.